STRAVINSKY (USA) (Bay 1996-Stud 2000). 3 wins-1 at 2, Newmarket July Cup, Gr.1. Sire of 1222 rnrs, 885 wnrs, 75 SW, inc. Serenade Rose (VRC Oaks, Gr.1), Keeninsky, Benbaun, (Sir) Time Keeper, Fleur de Lune, Balmont, Soldier's Tale, Captivate, (Mr) Baritone, Chinese Dragon, Kongo Rikishio, Ballet Society, La Sizeranne, Jeu de Cartes, Firebolt, Hips Don't Lie, Bird of Fire, Satinka, Cool Conductor, La Italia, Plagiarize, Pulcinella, etc. Folk Tales (g. by Stravinsky). Winner. See below. Dragon Lair - Zhuhai (Sing.). 3 wins-1 at 2-to 1400m to 2016 in NZ, Aust. and Malaysia, ARC Colleen Mangnall Prestige Real Estate 2YO H., 4th ARC Eclipse S., Gr.3, Matamata RC Slipper S., L.
Maharaaj. 4 wins from 1400m to 2250m, A$82,835, to 2015-16, 2d MRC Vawdrey Semi Trailers H., SAJC Oxford Insurance Brokers H., 3d MRC Le Pine Funerals H.
Soldiers Tale. Winner at 1200m, 3d Otago RC Brancott Estate H.
Dioxides. 2 wins at 1500m, 1800m in Aust. Foxy Cougar. Winner at 1200m in NZ. ENTIRELY PLATINUM (Pentire). 6 wins from 1400m to 1900m, A$592,510, ATC Sky High S., Gr.3, Canterbury Hurlstone RSL H., Vinery Yearlings H., Schweppes H., 2d MRC CF Orr S., Gr.1, Memsie S., Gr.1, Naturalism S., Gr.3, ATC Become an ATC Sponsor H., Adina Apartment Hotels H., 3d VRC Makybe Diva S., Gr.1, MRC PB Lawrence S., Gr.2, ATC Ibis Styles Draw H., 4th MRC Futurity S., Gr.1, ATC Neville Sellwood S., Gr.3. FOXY BLONDE (Volksraad). 6 wins. See above. Roving Owl (Volksraad). 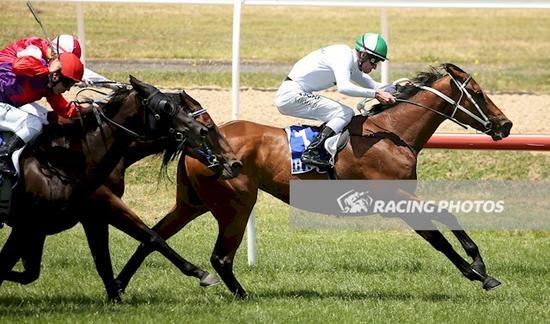 2 wins at 1100m, 1550m, A$108,860, AJC First Fleet H., Young Members H., 2d STC Tulloch S., Gr.2, Vodka Cruiser H., 3d BTC Rough Habit P., L, STC Harris Farm Welter H., AJC FC Griffiths H., 4th AJC Frank Packer P., Gr.3, STC Winter S., L.
James Blond - Travel Leader (H.K.) (Danske). 3 wins at 1800m, 2000m, NZ$9,500, HK$2,155,970, HKJC Mui Wo H., Elizabeth Arden H., Sutherland H., 2d ARC Guineas Trial, L, HKJC Siu Sai Wan H., 3d HKJC Osmanthus H., William Mong Cup H., Po Shek Wu H., Tsuen Lok H., Kolkata H., Tsim Sha Tsui H., Suzhou H., Jiangsu H., 4th ARC Great Northern Guineas, Gr.2. ASH BLOND (Mighty Avalanche). Joint third top filly on The 1994-95 NZ 2YO Free H. 6 wins-4 at 2-to 1350m, ARC Welcome S., L, Schweppes Juvenile H., DB Draught Juvenile H., Counties RC Norwood H., Rotorua RC Carson Taylor Ford 2YO H., 2d ARC Eclipse S., Gr.3, 3d Matamata Breeders' S., Gr.2, Waikato RC Star Way S., L, BOP RC Gartshore Group H. Producer. PENNY GEM (Pentire). 4 wins from 1400m to 2100m, NZ$231,050, A$36,500, WRC Captain Cook S., Gr.1, Counties Cup, Gr.2, ARC Clarins H., BOP RC TRAC Sports Rotorua 3YO H., 2d ARC Zabeel Classic, Gr.1, Waikato RC International S., Gr.1, ARC Eight Carat Classic, Gr.2, BOP RC Ultimate Motor Group Ford 3YO S., 3d Queensland Oaks, Gr.1, Te Aroha JC New Zealand Thoroughbred Breeders' S., Gr.1, 4th Egmont RC Fayette Park S., Gr.3. Producer. FAIRYGEM (Viscount). 5 wins from 1800m to 2400m, A$234,511, AJC Australia Day Cup, L, MRC Bruce Patchell H., Hayai H., Carpet Call Cup H., 2d Sportingbet Moonee Valley Night Cup, 3d Mornington Cup, L, 4th SAJC Adelaide Cup, Gr.2. Producer. ANALYST (Deputy Governor). 12 wins from 1000m to 1800m in Macau, Macau Derby, L, Macau Cup, L, Macau Chairman's Challenge Cup, L, Spring Trophy, L, Ashburton H., Autumn Trophy, 2d Macau Cup, L.
Race Record: 2 Starts 1-0-1 A$14,250. Winner at 1400m in 2016-17 in Aust.